I still have a ton of research reading to catch up on from 2018. This weekend, I read a paper about Europa. I wasn’t sure at first why this was on my to-be-read list, but by the end I knew why this one had caught my attention. Europa is one of the icy moons of Jupiter. It’s often listed as one of the most likely places in the Solar System where we might find alien life. That’s because there’s evidence of a vast ocean of liquid water sloshing around beneath Europa’s icy crust. Maybe someday we’ll be able to drop a little robo-submarine into that ocean and see if anything’s swimming around down there. But in the meantime, we’re really only able to explore Europa’s surface. And as you can see in the highly technical diagram below, no matter where you go on Europa’s surface, it’s cold. But in one specific region, Europa gets really cold. Or that region does a better job trapping the heat it absorbs from the sun, and so we detect less heat escaping back into space. Either way, something weird is happening. Unfortunately, our previous missions to the Jupiter system did not provide us any useful photos of that one specific spot on Europa’s surface. Our current Juptier mission, Juno, is unable to approach Europa at all, so that’s no help. So we can’t match this anomalous cold spot to a visible surface feature. However, the authors of the paper I read did suggest that this could be a sign of recent geological activity—the formation of chaos terrain, perhaps. And if that’s true, we might (might!) find the waters of Europa’s subsurface ocean seeping up to the moon’s surface. Maybe there’s fresh organic material seeping up onto the surface too. Maybe. Could be worth checking out, though. Don’t you think? Posted by J.S. 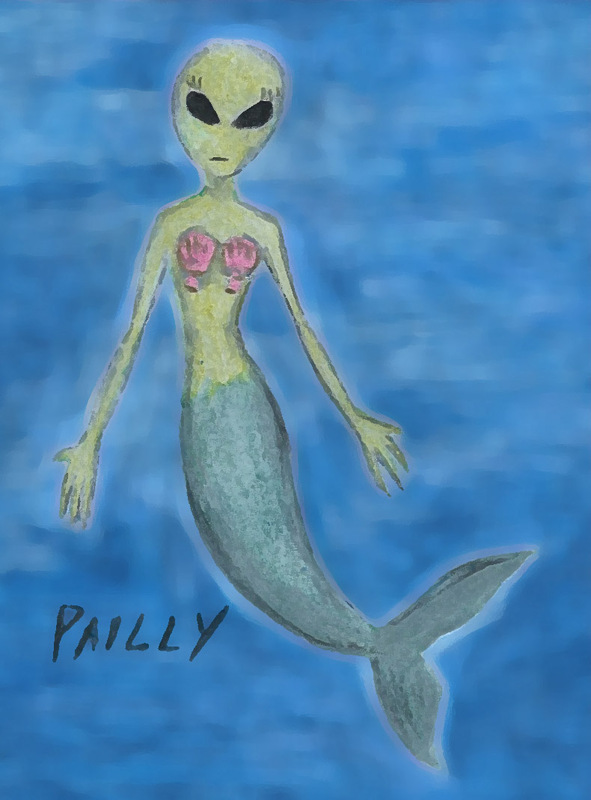 Pailly on January 23, 2019 in Space Science and tagged Europa, Juno Mission, Jupiter. I’m going to very disappointed if there’s no merfolk on Europa. What would we call life found on Europa? Europan? That could get confusing. that is AMAZING. Thank you for sharing! Europa does get a lot of attention, so I like the idea of shifting the focus to some other moon. Drilling on Europa does not sound feasible, unless the ice turns out to be thinner in some regions than others. Maybe this “cold spot” is one of those thin ice regions? Cool song! I will definitely keep it in mind. Could work well with an updated post on the skin-tight counter-pressure spacesuits NASA’s been working on.